Events - Two Rivers Cider Co. Check out our friend's son's hand crafted hard cider kickstart project! Click HERE for more info about this project and to see what goodies they send with every contribution; or click HERE to be taken straight to the contributions page! We now have Blood Orange Hard Cider in 22 oz. bottles! Look for them at a retailer near you. The craft-beer industry was booming in 1997, but hobbyist beer maker Vincent Sterne, though eager to enter the commercial fermentation world, decided to try another way in: apple cider. Not much has changed in the years since. Though apple cider is among the most popular beverages in Europe, craft cider makers in America remain few and far between. Yet a handful have recently appeared in Northern California, especially in the North Bay wine country, and around the country a quiet microrevolution seems to be gaining traction. Among these, the Sacramento-based Two Rivers has matured into one of the most adventurous and innovative cideries anywhere. While most Americans remain familiar with the sweet, fizzy, sodalike drinks from commercial cider brands like Ace, Crispin and Fox Barrel, Sterne—who often delivers kegs to bars and restaurants via bicycle—has ventured in an entirely different direction: bourbon-barrel aged cider and cider that is made with hops, honey, agave, smoked apples, jalapeños—these and more are the creative experiments that have emerged from Two Rivers’ steel tanks and oak casks. Sterne has fostered a steady relationship with apple growers near Placerville for years. But for many California cider makers who have entered the trade more recently, fruit often proves hard to come by. These entrepreneurs—about a half dozen of them, all making on an order of just 2,000 to 5,000 bottles per year—have struggled not only to find remaining orchards, but to convince their owners not to sell their land to developers who’ve converted most historical apple orchards into housing tracts and vineyards. Still, a handful of orchards—just enough, perhaps, to provide a start for a local cider industry—have been preserved, some intentionally, others by accident. One cluster of trees on the bank of the Russian River near Sebastopol was abandoned in the late George H.W. Bush era. Blackberry vines crawled over the property, and the small orchard disappeared. Crop after crop of fruit fell in the timeless way of trees, while just miles away the world raced forward. Only in August 2011 did the snipping blades of a rose trimmer finally part the brambles as two Sebastopol residents stepped into this long-lost secret garden. Then, farmers Scott Heath and Ellen Cavalli were determined to enter the cider business. Their quest for fruit, plus a helpful tip from a landowner, brought them searching in this overgrown jungle, which had been planted with heirloom apple trees, then abandoned, in a failed cider endeavor some 20 years ago. But now, it seems to be. 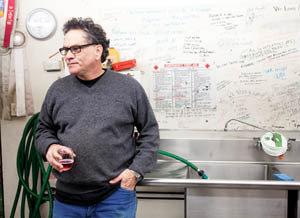 In 2011, Heath and Cavalli, owners of Tilted Shed Ciderworks, produced about 1,400 bottles of cider. This year, they’ve quadrupled their volume, pressing two dozen apple varieties for about 1,200 gallons of juice, scheduled for release in the early summer of 2013 after several months of aging. Their ciders include the Graviva! Semidry Cider, a blend of Gravenstein and several heirloom varieties, and the January Barbecue Smoked Cider, made with additions of smoked apples. Other Northern California entrepreneurs prospecting in the frontier of hard cider include the AppleGarden Farm in Tomales and Apple Sauced Cider in Sebastopol. In southeast Petaluma, Murray’s Cyder is also growing. The company was first founded in 1998, then floundered until a man named Wayne Van Loon purchased it several years ago. Van Loon released his first ciders under the label in 2010 and has since doubled in volume, with 6,000 hand-corked bottles of the 2012 crop soon to appear at local retailers. Cider could follow a similar upward trajectory. In just the past year, American apple cider sales jumped by 65 percent, with gluten-intolerant consumers reportedly an important force in driving the market. Craft-beer drinkers have also taken a liking to craft cider, according to James Anderson, co-manager at Pangaea Two Brews Cafe on Franklin Boulevard. He says beer drinkers attuned to unusual flavors and creative styles may also develop a liking for the dry, tart, sometimes sour and often flat makings of craft cideries. Anderson says he occasionally offers seasonal releases from large companies, like Ace and Crispin. But the ciders from these labels tend to be “domesticated for the American palate and are often sweet and marketed toward women or people who don’t like beer,” Anderson says. Rather, Pangaea focuses on serving more obscure, innovative beverages—mostly beer but also a few ciders. Anderson recently put on tap an 11 percent alcohol by volume honey-apple cider (a drink known as a “cyser”) from Two Rivers called Honey Badger. While the market may be wide open for the growth of craft cider houses, the supply of fruit is limited—especially apples of the right kinds. Compared to familiar eating apples, cider-specific varieties are fraught with tannins and acids that make some of them too tart or astringent to eat but which bolster a finished cider with backbone, aroma and complexity. Although most craft-cider companies manage to use apple varieties bred for eating, the best ciders come from unusual apples with names such as Kingston Black, Nehou, Muscat de Bernay, Roxbury Russet and Porter’s Perfection. A turnaround in the decline of apple orchards could occur if cider makers demand one. Some farmers see promise in growing and selling apples to cider makers. Veteran apple grower Stan Devoto, for example, is committed to keeping his trees and, in fact, has converted through grafting about one-fourth of his small Sebastopol farm to heirloom cider apples. As California’s cider culture plants new roots, the future could be an uphill crawl for a while as cider makers seek out the fruit they need, whether by contracting with existing apple farmers or by growing their own. 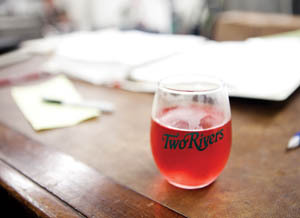 At Two Rivers, Sterne is planning a production expansion in 2013, and to help meet future demands, he is planting 5 acres of land with cider-specific apples—especially one variety, high in tannins and acids and resembling a large crab apple, called the Wickson. Van Loon, who currently has no trees of his own, expects the craft-cider industry to boom, whether he’s ready or not. It’s just a matter of time, he says—and, of course, access to the fruit.